More and more people are setting up their own businesses, and often this will mean doing some or all of your work from home. Not everyone has a spare room in their house to turn into a home office, and a popular solution is a garden office. There are some fantastic garden offices out there, so we thought we would show you a few of our favorites. This is the office that belonged to former blogger Vintagefrenchhen. Sadly her blog is no more, but her office attracted enough attention that it can still be seen in a few places around the internet. She moved to a former dairy farm in California, and quickly developed grand visions for the old milk house – a wonderful, spacious little wooden outhouse. A coat of paint inside and out and some very fine choices of furniture gave this building new life as a lavishly-decorated, vintage-style garden office. Although she found room for a fair amount of gorgeous old furniture, light colors and plenty of natural sunlight maintain a spacious, airy feel. You can see the Milk House featured in this fab rundown of enviable home offices [it’s number 3]. Space in London is at a premium and offices command lofty prices compared to just about anywhere else in the UK. 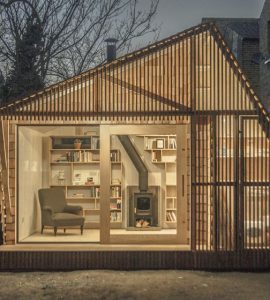 One author solved this problem by giving over the bottom portion of their garden to an office that would come to be called “The Writer’s Shed.” Calling this custom-designed studio cabin a shed sells it short. It was created to look like something from a children’s storybook, and boasts a façade of quality cedar and a large glass sliding door on the outside. The interior has traditional-yet-contemporary décor, a wood burning stove, and an impressive library across one wall. You can see some wonderful photographs of this project here. We think it would be a great place to work – a safe haven away from the hustle and bustle of city life. Most garden offices are either purpose-built, or adapted from a summer house or shed. One Belgian architect, however, has converted an old trailer from a construction site into a beautiful timber-lined office building. After buying it from the local council for about £12 and enlisting the help of a local farmer to deposit the trailer at its new home, the family completely stripped out the interior and refitted it into a masterpiece of minimalism designed for them by an architect. It has so little furniture it looks almost empty, but one clever multi-purpose fitting can be adapted into a desk, extra seating, or a day bed as required. This is a great project and all the work was carried out by the family – check out the pictures here. If all these wonderful garden offices have got you geared up to create your own garden office, then there are a few things you might want to think about. Wooden buildings usually give the best balance of price, quality, and comfort, and if you are thinking of adapting a standard summer house or shed then you might want to think about adding some extra insulation and a source of heat to keep it usable in the winter. If you want your wooden garden office to stay in good condition for the long run, you should also think about using a proper protective wood treatment. You can also take this as a chance to get creative with colors and styles. For example, Solid Color Stain will give you an opaque finish in a wide range of colors, while Textrol or D1 Pro will give a more natural, oiled look in a choice of different shades and being penetrative products they will protect the wood from within.